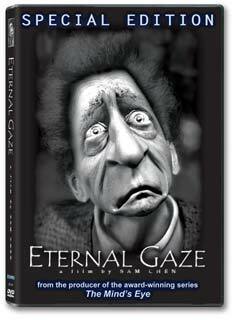 Oscar contender Eternal Gaze DVD is now available! ALBERTO GIACOMETTI. Inspired by the life and torment of this legendary man, ETERNAL GAZE is a story about an Artist, his Art, and Reciprocated Love. ETERNAL GAZE is a computer-animated film about a real person in a real location, produced in a medium with unlimited possibilities. The screenplay was inspired by a combination of ideas and facts based on Giacometti's real life stories ­ with a sensitive touch of fantasy added in. Like Giacometti, whose art was of construction and deconstruction ­ of reworking, decomposing and rebuilding, the Director utilized a similar methodology in his animation production in hopes of better understanding the subject matter and "to follow Giacometti's footsteps." With careful attention to historical facts and details, the works of art featured in this film are near-exact digital reproductions from Giacometti's lifework, each handcrafted to have the "agitated" surface and the elongated disposition that his sculptures are famous for. His cluttered Paris studio is recreated faithfully from its distinctively marked walls down to his grimy worn-down paintbrushes and turpentine dishes. Every frame of the film is meant to look like a page out of an Art History book. But most of all, ETERNAL GAZE is a heartfelt story and a loving tribute to one of the greatest artists of our time. Directed, Written and Animated by Sam Chen, multi-award winning artist within the computer animation field. The DVD is produced by Steven Churchill, the creator of the award-winning series "The Mind's Eye".